Looking for a great value double room here in beautiful Pembrokeshire? Look no further! Much cheaper than a traditional B & B and far less spartan than most other budget accommodation, we offer something refreshingly different. 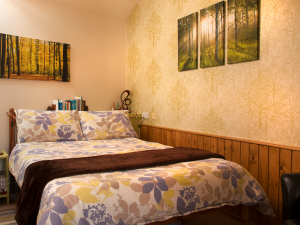 Our double rooms have comfy memory foam mattresses, interesting decor and an en-suite shower powered by green energy. Our light breakfast is inclusive in the price and further £££’s can be saved if you choose to self cater in our well equipped kitchen. We hope you’ll agree with our many Tripadvisor reviewers who have given us 5 out of 5 for value for money! 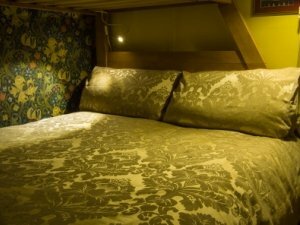 Our price for a double room is £22 per person per night. 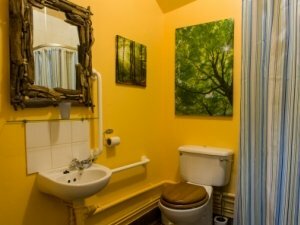 We offer 3 double rooms in the hostel and one separate in our Self-contained studio room. Our double rooms are carpeted, all have en-suite showers that are powered by solar thermal and green electricity and all have wash basins. Bedding and blankets are supplied and beds are made up for you with a duvet and 2 pillows each. The good quality beds are of solid wooden construction and have comfortable memory foam mattresses. Plus there are storage facilities for your belongings. Our double rooms are not large but most have seating ‘snugs’ to relax in. We’ve also tried to think of those extra touches that are often lacking in budget accommodation – things like hooks where you need them, hot water bottles stored under the bed and quality blackout blinds that don’t let in the light when you’re having a lie in. 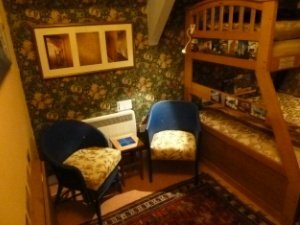 There are handy shelves by the beds, a selection of short stories on hand and a bedside light to read them by. Regular guests often have their favourite double room and we’ll always try to accommodate you in the double room of your choice if you have a preference. 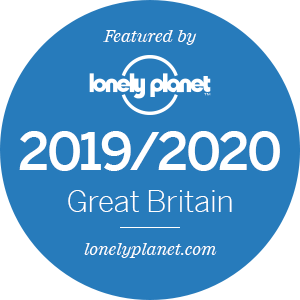 Also, as mentioned in the introduction above, don’t forget that one of the best features about hostels compared to B & B’s and budget hotel chains is that there’s a well equipped kitchen for you to use so you can save £££’s by not having to always eat out. It’s nice to dine out on occasion and there are some great places to eat nearby but sometimes a night in is just the ticket. 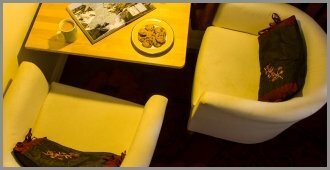 Rustle up a quick bowl of pasta or a 3 course meal then retire to the cosy lounge or your double room with a coffee or a glass of red. Here at The Old School Hostel the choice is yours. Room 3: Standard sized 4’6” wide double with bunk above. Seating area. En-suite shower. Room 5: Standard sized 4’6” wide double with bunk above. Seating area. En-suite shower. Room 6: Standard sized 4’6” wide double. Seating area. En-suite shower. Self Contained Studio Room: Separate from the main hostel building. Standard sized 4’6” wide double. Seating/dining area. Kitchenette. En-suite shower and toilet. A budget double room that you won’t forget (and for all the right reasons we hope! ), Room 3’s decor is fun and young at heart. It has a bunk bed with a standard size 4’6” wide double bed making up the lower berth. The bed is of top quality solid wood construction and there is good headroom. The room has an en-suite shower, a wash basin and a seating area featuring groovy 60’s style chairs. There’s a flap down table to write or snack on. The loos are close by just along the corridor. The standard rate for this room, a light breakfast included, is only £22 per person per night even in high season. Click on the prices tab for full details. Our personal favourite, Room 5’s claim to fame is that it has the most expensive wallpaper to be found in a hostel anywhere in the world (perhaps)! More importantly it features a top quality bunk bed of solid wood construction with a standard size 4’6” double making up the lower berth. There’s an en-suite shower powered by green energy and a wash basin. Plus there’s a snug seating area with a flap down table to write or snack on. The standard tariff for this double room is only £22 per person per night including a light breakfast which incorporates organic ingredients. See the prices tab for full details. For a little added interest all the bedrooms at The Old School Hostel are themed and in two of them the decor has been inspired by our favourite charities. Room 5 is ‘The Landmark Room’ and is a homage to ‘The Landmark Trust’ a small charity whose creator, Sir John Smith, had the simple but brilliant idea of saving special old buildings that had often fallen into dereliction and then making them then pay for their keep by renting them out as holiday homes. Often the simple ideas are the best. The walls of room 5 are adorned with photos of some of these wonderful old buildings. We’re dead chuffed when, now and again, we receive a postcard from guests who, after staying with us, have been inspired to go on and stay in a Landmark. This is often our regular guests favourite and has a hint of a romantic boutique hotel bedroom about it. 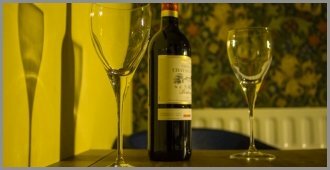 At £22 per person per night don’t expect The Ritz but we have set out to create something refreshingly different from a typical hostel room. The standard size 4’6” double bed has a comfortable mattress and is made up with superior quality bedding, there’s an en-suite shower and wash basin and tub chairs with a flap down table that form a little snug to relax in. Room 6 is available as a family room too as there is also a bunk bed in it. The windows offer a view over the adjacent Grade II listed chapel with its recently restored exterior. The room is finished off with quirky little touches of 50’s inspired memorabilia. Click on the prices tab for the double room rates. 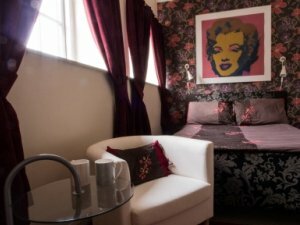 We didn’t set out with the intention to theme the rooms but when a guest phoned us requesting ‘The Marilyn Suite’ because of the famous Andy Warhol print, (a copy alas), that hangs above the bed, it sowed the seeds of the idea. 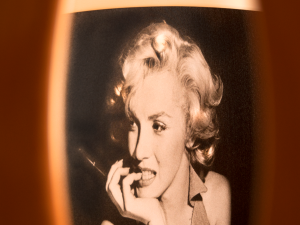 ‘Suite’ is stretching it a bit but Room 6 is now officially The Marilyn Room. 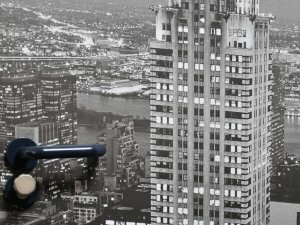 We’d like to think it’s unique but she is a popular gal and no doubt there are others out there, from Miami to L.A. to Tokyo, (everything can be found in Tokyo). We’ll have to content ourselves with being the cheapest (maybe) and being British, definitely the most tastefully decorated Norma Jean room the world over! Our self contained double room is separate from the main hostel premises. Ty Popty has a shower and a loo, a kitchenette with a hob, microwave and fridge, comfy tub chairs and a flap down table to dine at. There is good wi-fi reception in this double room, as in our other 4. The standard size 4’6” wide double bed features a good quality memory foam mattress. ‘Ty Popty’ is Welsh for Bake House and is where the school dinners were once cooked (but we promise that the aroma of boiled cabbage has long since disappeared!). Ty Popty is decorated with a restful theme of trees and forests with driftwood coat racks and mirrors adding the finishing touch. It offers perhaps the best of both worlds because you have your own self contained hideaway but usually* guests also have access to the main hostel building with its lounge, full kitchen facilities, drying room etc. Ty Popty is available from £27 per person per night including a light breakfast. Click on the prices tab for full details. The minimum length stay in Ty Popty is normally 2 nights unless we are filling in gaps in bookings. *If a group has booked the hostel for their exclusive use please note that guests in ‘Ty Popty’ will not have access to the facilities in the main hostel building. ALL RATES INCLUDE A SELF SERVICE BREAKFAST WHICH INCLUDES CEREALS, A QUALITY MUESLI, SELECTION OF PORRIDGES, BREAD FOR TOAST, BUTTER OR DAIRY FREE SPREAD, MARMALADE, JAMS AND MARMITE, FAIR TRADE TEA AND ORGANIC FAIR FRADE COFFEE AND ORGANIC MILK. All ingredients as available. COOKED BREAKFASTS ARE SERVED IN THE VILLAGE CAFE 7 DAYS A WEEK. SEE THE ‘BED AND BREAKFAST’ PAGE FOR MORE DETAILS. Packed lunches can also be ordered from the village cafe. We always try to accommodate guests in the double rooms of your choice if you have a preference but occasionally need to make alterations so cannot guarantee this. If we do need to do this it will be to a room with similar or better facilities. 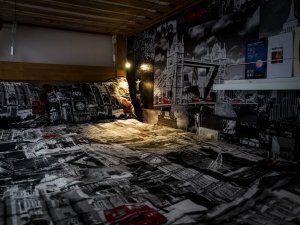 For example we will not alter you to a room with a smaller width bed.